Here's the entire first CD plus the web freebie (Do Anything) for you to "try before you buy". If you like it then please buy the CD from cdbaby.com. If you like it but not enough to part with any cash then please keep this podcast as long as you want and just be sure to pass it on to any friends you think would like it. 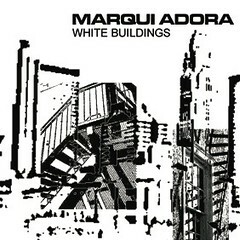 Go to marquiadora.com for more information on where you can buy the White Buildings CD. If you're a follower of the local hipster club scene, you've probably heard of Marqui Adora. But you've probably rarely, if ever, actually seen the group play. Since last year, the moody three-piece has only infrequently emerged from the shadows that inform its dark, postpunk sound. Tonight's show, though, might make good on the promise of a real return, what with the band's June release of its debut full-length, White Buildings. Not to say that the band's members have been absent from the South Florida music world. Frontman and guitarist Danny Ashe is a tireless DJ and promoter at events catering to more discerning ears. He's known equally around town for his signature vintage scarves and aviator shades as for his sets that eschew the played-out indie Top 40 hits in favor of sets linking the oft-forgotten past avant-garde with the new. (And former ravers might remember drummer and programmer Joe Shockley for his residency at the legendary Nineties drum 'n' bass night Beatcamp). The bandmates' encyclopedic musical knowledge means that Marqui Adora escapes simply rehashing their influences. The tracks on White Buildings recall darker Eighties groups such as Joy Division and Bauhaus but veer away from goth murk with their angular, danceable rhythms. Meanwhile the subtle electronic influence, courtesy of Shockley, plants it all firmly in this decade. Let's hope it won't take another one for Marqui Adora to properly get going. Like most artistic types we’ve taken our sweet time getting it done but we are very pleased with the finished product. Danny, Joe & John pour drinks and discuss the brief history of Marqui Adora's recording process and why it's taken almost 2 years to finish a record. This is our first podcast. It's just a quick hello and brief introduction to our plans for this podcast feed.